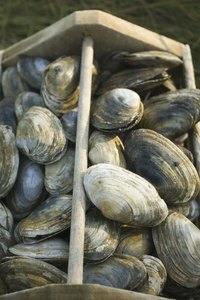 Whole belly clams, a dish popular in the New England region of America, are ordered two main ways: either as clam strips or whole belly clams. Both are fried, and the strips are simply the clam with the belly removed. A whole belly clams refers to an entire clam that has been breaded and fried. While many varieties of clams are available on the market, whole belly clams for frying typically come from a select type known as soft-shell clams. Also referred to as long-neck or Ipswich clams, they are removed from their shell with a focus on keeping the belly joined to the neck. If the belly separates, the clam is set aside for clam strips. The soft-shell clam grows between three and four inches. When closed, a siphon protrudes at both ends -- one to allow food consumption, the other to eliminate waste. A leathery membrane, also visible on the outside of the shell, encases both siphons. The membranes are removed as part of the cleaning process before cooking. While recipes vary, the basic process is the same: Shuck the clams, remove them from the shell, slide off and discard the membrane of each siphon. Allow the clams to soak in water for 20 to 60 minutes to remove sand or grit, then pat them dry. Bread the clams using cornflour-based breading and fry in a stockpot with oil at 365 degrees Fahrenheit. Remove the clams using a wire strainer when they've taken on a golden-brown color. Set aside to cool and pat try to remove excess oil. Serve with a lemon wedge, cocktail or tartar sauce. While exact nutritional value varies based on ingredients and frying method, a 3/4-cup serving of fried whole belly clams has roughly 450 calories, 25 grams of fat, 29 grams of carbohydrates and 13 grams of protein. A serving of fried clams provides over almost 17 percent of the recommended daily allowance of iron.